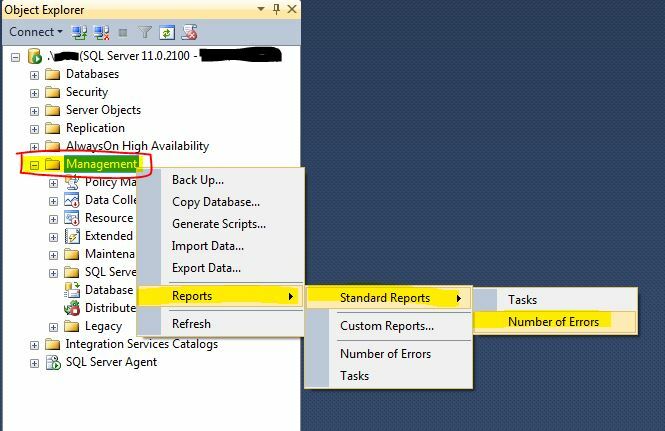 SQL Server Database Snapshots – Things to remember! 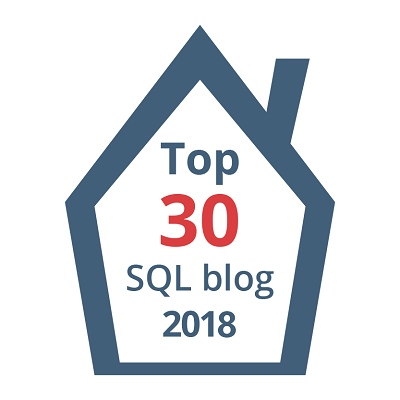 In this blog post, let’s see what SQL Server database Snapshots are and how they can be created and how to revert to a DB Snapshot and few important things to keep in mind before making use of them. Microsoft introduced database snapshots in SQL Server 2005 as an enterprise only feature(I believe, that’s true even with SQL 2014…but I could be wrong). The basic concept of a database snapshot is to create a read-only, transactionally consistent(as of the moment of snapshot creation) static view of a given database. Even though they are named as “DB Snapshots”, they have got nothing to deal with Snapshot replication or Snapshot Isolation. When could a DB Snapshot be useful? Most common use case: Let’s say your DEV/Testers are doing some testing(which makes whole bunch of changes to your database) in your test environment and they want the database to be reverted to a state how it was prior to the testing once they are done. A Snapshot works awesome in this case. Reverting is waaaay faster than restoring your database(especially when you are dealing with huge databases). See this for more info on how they work behind the scenes, when will they grow in size, other use cases and Gotchas to remember while using Snapshots. Let me brief a few important things here. DB Snapshots are not substitutes for your DB backups. Irrespective of whether you’ve snapshots or not, you should have healthy restorable backups in place. Don’t treat DB Snapshots as DR or HA solution. Snapshots will introduce IO overhead, depending on workload on your Source Database. You can’t backup a DB Snapshot and can’t attach/detach a snapshot; you can’t create snapshot for System Databases. No GUI for creating Snapshot(Only T-SQL). You can’t drop Original Source Database as long as a referring snapshot exists for that database. No FAT32 support(Snapshots work on NTFS Sparse files technology). Since they are read-only, static copies…new users can’t be added. Make sure you’ve enough space on the drive holding your Snapshot file. If the drive runs out of space, Snapshot will be marked as “SUSPECT” by SQL Server. If your DB is not in SIMPLE recovery mode, Take a log backup before you perform Reversion to secure everything since your last log backup. Full Text Catalogs will be lost once you revert your database. Be careful, if your database uses Full Text features as this could be an unpleasant surprise. Both the source DB and the snapshot will be unavailable when the actual reversion process is in progress. Source DB should be Online,No read only file groups should be present in your Source DB to be able to revert from a snapshot. 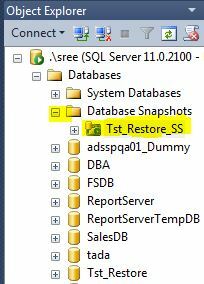 I’ve a database called “Tst_restore” which has 3 tables and this will be my source database for this demo purpose. I’ve created Snapshot as shown in the below screenshot. Now you can see I’ve a snapshot created. See below for the Properties(files section). Now, let’s see how to revert a database to a Snapshot. Assuming something went wrong and you want to revert to snapshot which you’ve taken in the above step, you can use below syntax. As you can see above, to be able to revert we need exclusive access to the database(same as restore). Hence I am taking DB offline and bringing it back online immediately. Note: Don’t forget to bridge the gap in backup chain right after you revert to a Snapshot. As I’ve already mentioned reverting to a Snapshot will break Log chain. Log backups will fail if you forget this step. 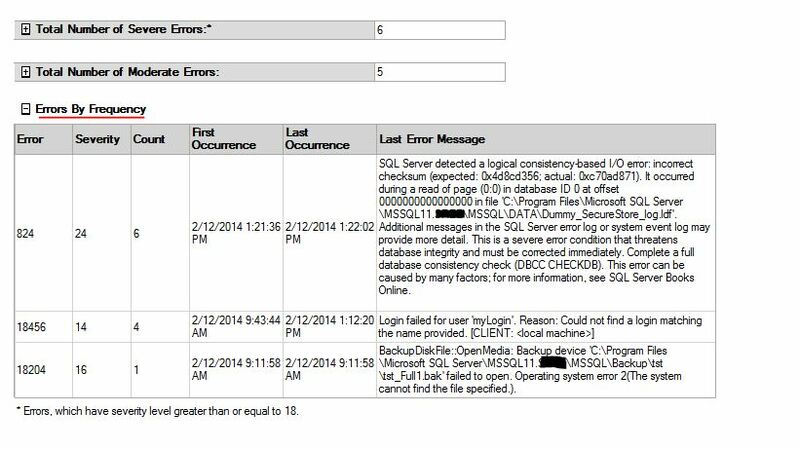 SQL Server Error Logs – My First Poll. With SQL Server 2014, Microsoft is bringing a lot of features/enhancements into the wild, one of them is “Buffer Pool Extension” AKA BPE. ( Enterprise edition Only). With RTM, MSFT announced that even Standard edition has this feature. so, what is BPE? The name itself is pretty much self explanatory…It’s an extension for your Buffer pool. yes, with this you can use any non volatile storage device(SSD’s preferred) as an extension for your SQL Server Buffer Pool. Basic idea here is to eliminate requirement of “adding more physical RAM”, Instead you can mount a new Drive and tell SQL Server to treat that newly created drive as Buffer Pool. Sounds very interesting right? 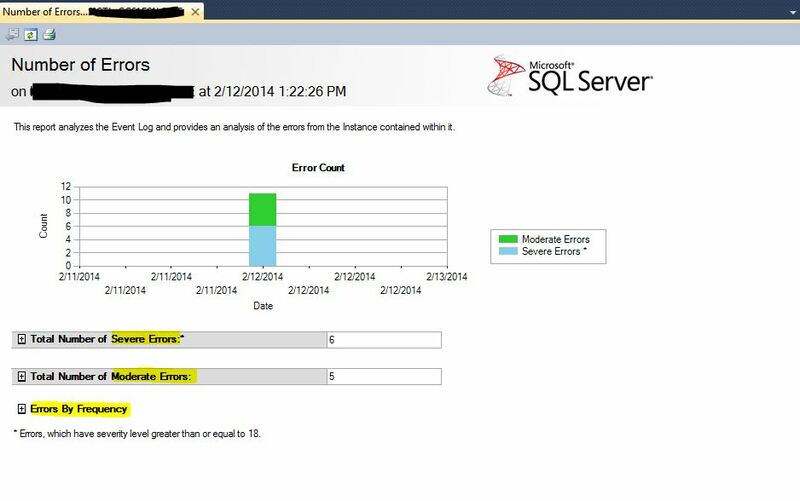 But there are few limitations Per Microsoft SQL Server Team’s Blog which we should keep in mind. Might not be useful for OLAP/DSS Work loads. Even in OLTP workloads, improvements are very limited for Write-heavy work loads. If your server got more than 64 GB of RAM, don’t expect much from this. Personally, for me these limitations are really frustrating. On one hand, this is Enterprise only feature and on the other hand, they are saying don’t expect much from this if your SQL Server has got already more than 64 GB of RAM allocated. What are the chances, any DBA would build a new SQL Server 2014(Enterprise) with less than or equal to 64 Gigs in 2014 or 2015? I would say almost “NIL”. Performance Gain on Read heavy OLTP Work Loads. Use High throughput SSD for better results. Start from 4x-10x of the Memory available to SQL Server. I’ve created a new Drive(BPE) for this demo purpose as shown below. Well, now I increased the size to 600MB and now I got a different Error message(See below)! Am not sure why this happened, but I’ve created a new Drive (F$) with 2 GB size and it worked this time without any issues as you can see below!! !…I will investigate further why this happened some time later. Can We alter the size of BPE? Nope, we can’t. We have to basically disable and recreate it with new size. Caution: When you disable BPE, chances are….you will get into significant Memory Pressure situation and hence increased IO Pressure. Bottom line: IMHO, this idea sounds interesting, but I don’t think I would implement this on a production SQL Server considering the limitations it has(YMMV). I would rather convince my management for purchasing real Memory which has no hand cuffs and no limitations! After all….What are the chances my client doesn’t have money to purchase more DRAM for the sake of true performance boost when they’ve enough money to purchase High Performance SSD’s just for the sake of BPE(which promises me only limited performance gains)? . Remember folks…..now a days physical RAM is very cheap. Hello folks…I am very pleased to announce a brand new name and identity which I’ve given to my blog. It will be http://www.mssqltrek.com from now on. For feedback and suggestions, please shoot an email to sree@mssqltrek.com. 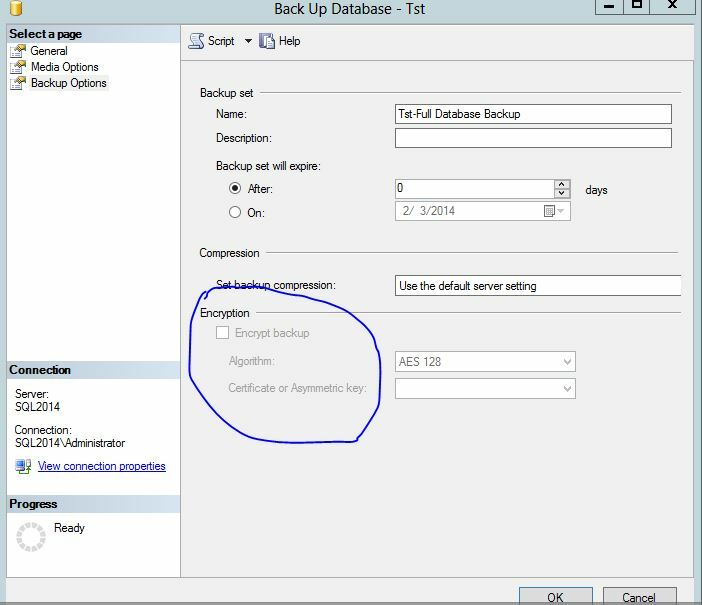 Microsoft SQL Server 2014 for sure is bringing a lot of cool features/enhancements to aid DBAs and Database Developers….and one of my favorite features it has to offer for a DBA is “Native Database Backup Encryption”. Let’s say you need to send a backup to Vendor and you want it to be encrypted as per your company security policies. Well, there is no way you can create an encrypted SQL Server database backup natively without help of third party backup tools from vendors like RedGate, Dell, Idera etc. If we don’t have any of those backup tools in our shop, our choice will be pretty much restricted to enabling TDE on the database and take a backup which will be automatically encrypted as well(Unfortunately TDE is Enterprise Edition only feature). What if you are running on standard edition? Note: We should create Master Key and Certificate to be able to Encrypt the database backup. Is this Enterprise Only Feature? Nope 🙂 You can take Encrypted backups in Enterprise,Business Intelligence and Standard Editions. Do we need to Turn on TDE at database level? What are the supported Encryption algorithms? AES_128, AES_192, AES_256, and Triple DES. Okay folks, now It’s Demo time……I’ve SQL Server 2014 CTP2 Installed in my lab and I created a test database “Tst” for this demo purpose. As of now, it’s a brand new Instance and a brand new database without any keys and certificates. 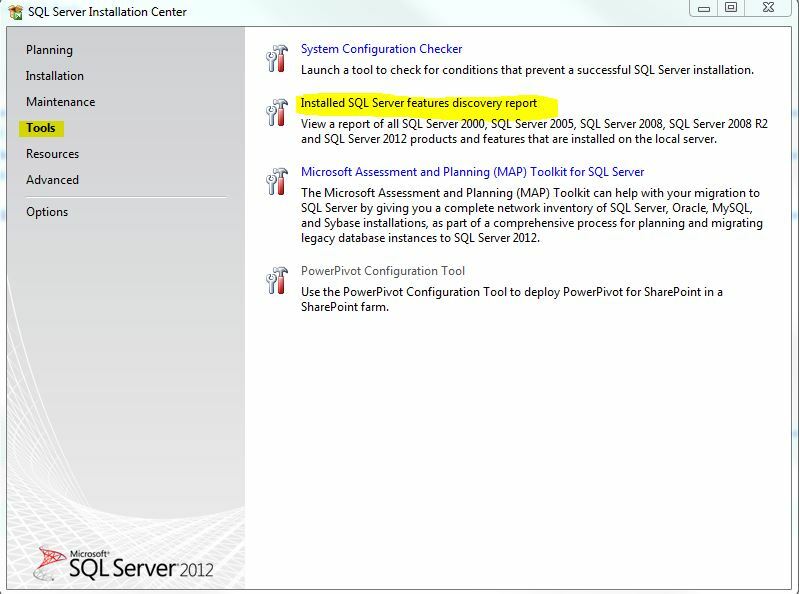 Step 2: (Am using SSMS for now). 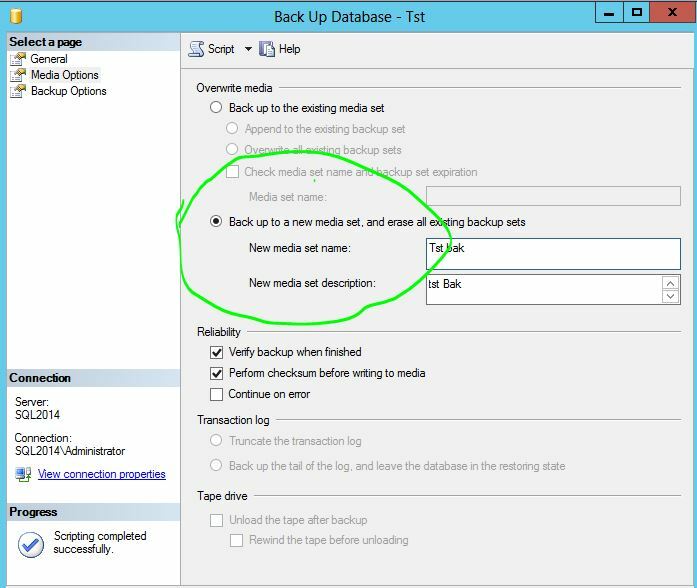 Go to Database Tasks from object Explorer and select backup. In “General” tab , select your database Backup Path and now navigate to “Media Options” tab. 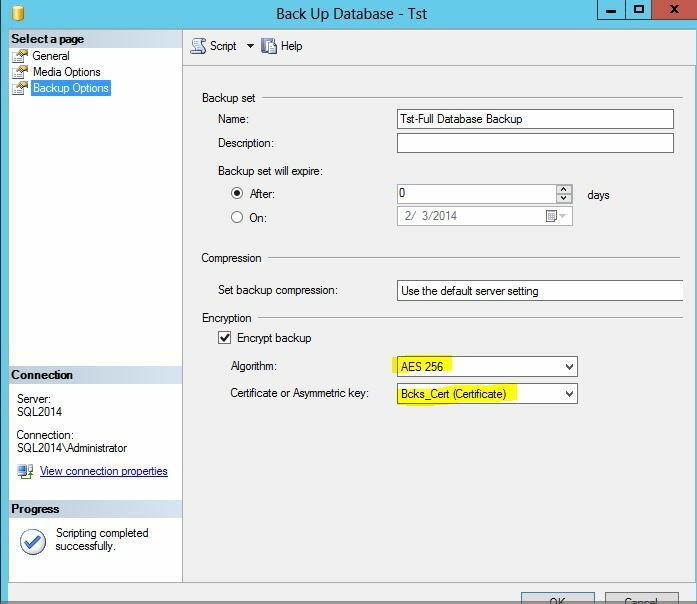 This is important…“Backup to existing Media set” is not supported for Encrypted Backups as of SSMS 2014 CTP2. You should select “Backup to a new media set“(Shown below). Am not sure if this intended or Just a bug which will be fixed in RTM. After selecting your backup path and selecting Backup to new media set, check the Encrypt Backup option in the “Backup Options” tab and select your desired Algorithm and choose the Certificate which we’ve created in Step 1. In the next post let’s see how to restore this encrypted backup.